The protozoan parasite Giardia duodenalis (also called G. intestinalis and G. lamblia) is one of the most commonly found intestinal pathogens in humans and animals. 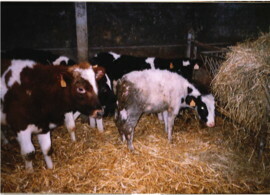 In ruminants G. duodenalis is highly prevalent, especially in young calves. The prevalence and cyst excretion in calves peaks around one month of age, and gradually decreases afterwards illustrating the slow development of a protective immune response against G. duodenalis. The continuous cyst excretion causes an elevated environmental contamination facilitating transmission and re-infection. In cattle, infection with G. duodenalis is associated with diarrhea, ill thrift and decreased weight gain, impacting economic sustainability. At present, no chemotherapeutics are licensed for the treatment of G. duodenalis infections in cattle, although some such as benzimidazoles and paromomycin are known to be effective. Nevertheless, all currently available treatments lack persistent efficacy and calves are re-infected shortly after treatment. Whilst some Giardia species are host-specific (e.g. 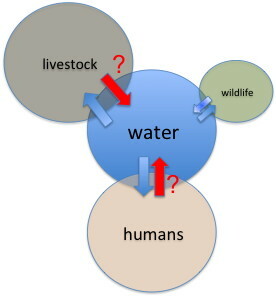 G. canis in dogs or G. bovis in livestock), other species are zoonotic and can be transmitted between animals and humans (G. duodenalis and G. enterica). Transmission can occur by direct contact with an infected individual or indirectly, through faecal contamination of food or water. As cysts from different Giardia species cannot be differentiated morphologically, unravelling transmission patterns is a challenging task. Using molecular tools, we investigate the presence of different Giardia species and genotypes in different host species. The role of water as a vector for Giardia transmission and the role of agricultural and human waste as potential sources of water contamination are investigated. In addition to the epidemiology of Giardia, the effects of giardiosis on animal health and productivity are studied and antiparasitic drugs are evaluated for their beneficiary effect on animal productivity and parasite transmission. Despite Giardia duodenalis being one of the most commonly found intestinal pathogens in humans and animals, our knowledge of the immune response against this pathogen is largely based on in vitro studies and infection trials in mice with a human-derived axenised G. duodenalis assemblage B isolate or G. muris. Very little is known about the host-parasite interactions in its natural hosts. To identify conserved as well as host-specific immune responses to Giardia, the intestinal responses in calves following a G. duodenalis infection, and the intestinal responses in mice infected with G. muris, are investigated using a molecular approach (e.g. microarray) and immuno-histochemical techniques. The role of antigen presenting cells, such as dendritic cells, in the immune response against Giardia is also poorly documented. Therefore, the interactions between Giardia trophozoites and bovine and murine dendritic cells are studied, as well as the potential of these stimulated dendritic cells to polarise adaptive immune responses.